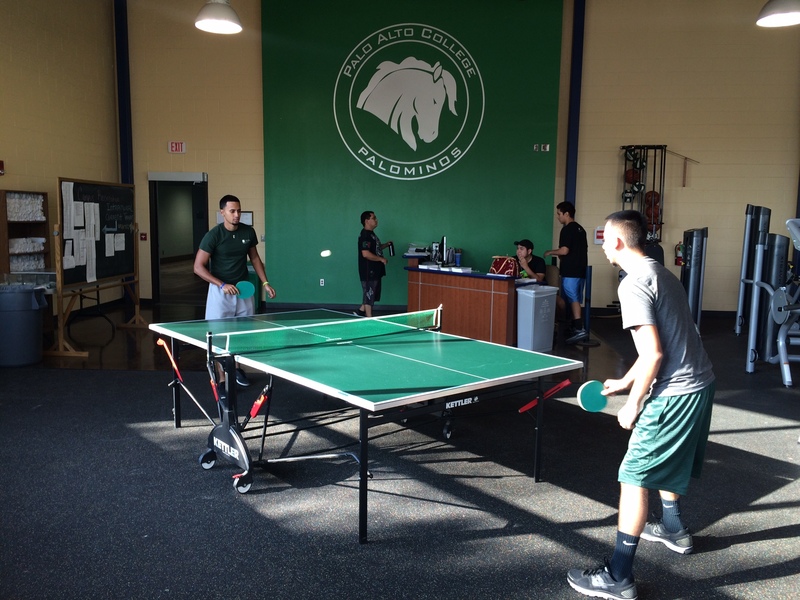 At Palo Alto College, starting a healthy lifestyle is made easy for all students, faculty and staff all year-round in a variety of ways. Intramural leagues, tournaments and open games, as well as a fitness center, an aquatic center, a gymnasium, tennis courts and walking trails are made available to help start and maintain your healthy lifestyle. Jimenez works out six times a week and claims the best benefits from exercising are a rocking body, better breathing, determination and better focus. Frausto works in the Fitness Center and is a referee. He also participates in all four intramural leagues: football, soccer, basketball and volleyball. “When you start, you need to be open-minded,” said Frausto. The Fitness Center has three rules: first, always bring your school ID; second, no bags allowed in the Gym or Fitness Center, but you can have bags in the Aquatic Center; and third, always wear gym attire. In the Aquatic Center, Juan Chavez, a freshman Psychology student, teaches swimming classes. The water is naturally resistant to movement, so you’re working all your muscles harder to make it through the water without harming the joints. It was the first day back in the gym for Melissa Moya, library staff assistant, after she noticed online that the Aquatic Center is available for lap swim from 5:30 p.m. to 7:30 p.m. Monday through Thursday. For more information on the Gym, visit the Fitness Center and Aquatic Center’s webpage.